It is disappearing to be a mother. That is the first thing that comes to mind. I try to mull over it, to move a different direction. But the point of 8-minute writing prompts is to go where you are set. And that leads to me to say that it is a disappearing act to be a mother. I have been a mother for 12 years. My oldest had her birthday in September, and this year she will be a legit teenager. I'm not overly worried. She's not the type to be overly worried about. But 12 years is a long time to be mainly concerned with the survival of others, and it seems odd that it has been that long. Still, despite it's oddness, I really can't remember a before. I have six children. That's a lot of people to keep alive. To keep clothed and fed and clean. To teach manners and morals. To give good starts to, to encourage adventures for. Is it any wonder I've managed to disappear? That I've managed to lose track of who I ever was? It makes me wonder if there is that person. I'm not so very sure. I recently filled out a survey about things I would like to have done for me. I have no idea what I would like to receive. To be alone. Yes. To not make dinner. Yes. To have my house stay clean after I cleaned it. Most definitely. But in the marrow of my bones, what do I want exactly? I haven't the foggiest. As I write, my youngest pulls on my clothes. She wants milk. I ignore her. I am deep inside my 8-minutes after all. She will have to wait. She doesn't understand. She's 1 1/2. She gets a cup. She gets a chair. She pulls at me again. Gaka. She says. Milk. She opens and shuts her fist, reminding me I taught her the sign. but still I do not moved. The thing is, I haven't disappeared as much as others. I keep real boundaries with my children. I don't let them in the bathroom. I have an unrelenting nap time hour when I must be left alone. I've kept my personality and don't pretend I like to play or speak in saccharine voices. I tell them no when I'm in the middle of a task. I make them wait. But when it hits the fan, my needs come last. Throw up doesn't take excuses. And it certainly doesn't clean itself up. 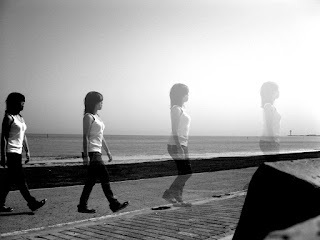 I don't know if it's possible to not disappear. It might be pleasant to say so. It might be worthwhile trying. But I don't think it's a reality to care for all these people, to make them grow and to stay my own person all the while. They've eaten me up since they were conceived. I invited them to do it. I'm happy to let them stay. But it's true - it is a disappearing act.